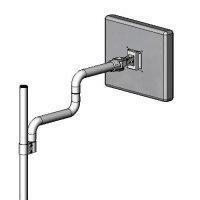 Pole mount LCD dual dental arm(model #60225D series) - Sallas Industrial Co., Ltd. This pole mount 2-section dental arm is designed to be light weight, of high quality appearance and competitively priced. The design incorporates display tilt and rotation adjustment. Ruggedly constructed from rigid steel tube with quality surface coating and provision for internal housing of monitor cabling. Arm side to side rotation and 360 degree display side to side rotation. 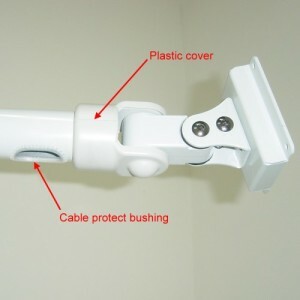 Durable aluminum alloy pole clamps available for 1.5" or 2" pole. Cables can be well organized inside the arm housing.